Early in World War I, various Americans, sympathetic to the Allied cause, offered their service to France as ambulance drivers, while some of their countrymen fought in the trenches as members of the French Foreign Legion. A handful of these men successfully transferred to the French Aviation Service at the end of 1915 where they were joined by several Americans who enlisted as civilians. Some of these men suggested they sent to the Front as a squadron (escadrille) composed of American rather than French pilots. After months of deliberation by the French Government, the Escadrille Americaine, N.124, was formed and, on April 20, 1916, placed on front-line duty at Luxeuil-les-Bains, near Switzerland. Escadrille Americaine was commanded by a Frenchman, Captain Georges Thenault, initially with seven Americans assigned as pilots  Norman Prince, Victor Chapman, Kiffin Rockwell, James McConnell, William Thaw, Elliot Cowdin, and Bert Hall. During the succeeding 20 months at the Front, an additional 31 Americans signed on as pilots. It flew its first mission on May 13, 1916. Five days later Rockwell scored their initial victory by shooting down an LVG recon. On June 23, 1916, Chapman was shot down and became the first Escadrille Americaine pilot to die in aerial combat. When the unit's fame spread, the German government protested about the use of the "Americaine" in the title, since the US was still neutral at the time, and its name was changed to Escadrille Lafayette in December 1916. Because of world-wide publicity, other Americans inquired about flying for France. As a result, a committee of American and French businessmen known as the Franco-American Flying Corps  subsequently as the Lafayette Aviation Corps (correctly pronounced "La-feet" and not "La-fay-yet"), then Lafayette Flying Corps  was created to assist young Americans in enlisting in the French Aviation Service. More than 200 Americans eventually were trained by France as flyers, and most were assigned individually or in twos and threes to various French escadrilles. To say they served with the Escadrille Lafayette would be an historical inaccuracy; rather they all were "members" of the Lafayette Flying Corps, an organization which never actually served as an entity at the Front. In February 1918, escadrille airplanes and most of its pilots were taken over by the United States military, and French ground personnel replaced by members of the AEF's 103rd Aero Squadron. 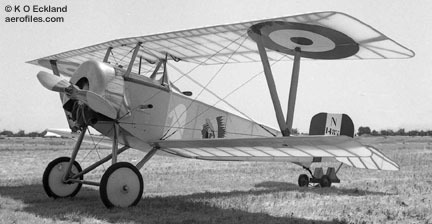 During its illustrious history with the French Aviation Service, the Escadrille Lafayette had served on practically every battle front in France, had downed 57 enemy aircraft, and lost nine of its pilots in action. Although Americans in the French Aviation Service were of immense value to France, probably their greatest contribution was in 1918 after most had transferred to the AEF's Air Service (USAS). As combat veterans, they were the pilots that the USAS depended upon when sending its own "green" pursuit pilots at the Front. Because of their experience, they were assigned to newly-arrived American units where they could pass along their combat knowledge to the fledglings. One can only guess the number of inexperienced USAS pilots who survived their initial patrols over the Front under the protective guidance of a handful of their countrymen who previously had fought under the French Flag.